Origins of life studies represent an exciting and highly multidisciplinary research field that incorporates contributions from geologists, physicists, biologists, mathematicians, chemists and computer scientists, inter alia. It was Charles Darwin who first hypothesized that life may have begun “in a warm little pond, with all sorts of ammonia and phosphoric salts, lights, heat, electricity”, effectively giving birth to the “primordial soup hypothesis”. In 1953, Miller reported the stunning results of an electric discharge on a model atmosphere for the primitive Earth. The surprising result of this experiment was a substantial yield of a mixture of amino acids, thus providing support for the primitive soup theory. However, the chemical reactions involved in those experiments have never been studied at the fundamental atomic and electronic level. Here we present the first ab initio theoretical simulations of Miller experiments (1). 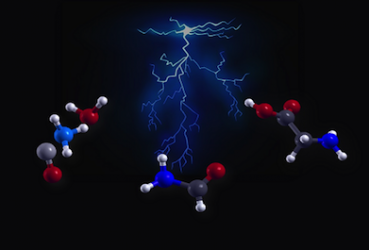 This study, based on state-of-the-art ab initio metadynamics analysis of free-energy landscapes (2), shows that glycine spontaneously forms from mixtures of simple molecules once an electric field is switched on and identifies formic acid and formamide as key intermediate products of the early steps of the Miller reactions, and the crucible of formation of complex biological molecules. These results, which have had a large resonance in the scientific and large public press (3), pave the way to novel computational approaches in the research of the chemical origins of life. A. Marco Saitta obtained a PhD in Condensed Matter Theory from the International School for Advanced Studies (SISSA/ISAS) in Trieste in 1997, and then moved to Philadelphia, USA, for a postdoctoral position at the University of Pennsylvania. In 2000 he was appointed Maître de Conférences at Université Pierre et Marie Curie, and where he is currently full professor. A specialist of electronic structure theory and ab initio calculations, his research activity has spanned from bulk semiconductors to graphene and nanotubes, to water and ices. His main interests are the exotic properties of molecular crystals, liquids and amorphous at extreme conditions of pressure and temperature, for which he has received in 2006 the Young Scientist Award from the European High Pressure Research Group. In recent years his research has opened up into more interdisciplinary fields, such as Earth sciences and geochemistry. He has authored more than 70 articles, including 1 Nature, 2 Nature Materials, 2 PNAS, and 18 Phys. Rev. Lett. He serves since February 2013 as Deputy Dean of the Physics Faculty of UPMC.